More than 10 years after "DodgeBall: A True Underdog Story," ESPN is launching a real-life ESPN8: The Ocho for a 24-hour special on Tuesday, Aug. 8 (or 8/8). 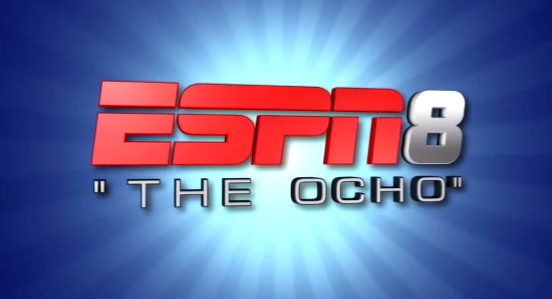 The Ocho will take over ESPNU for a day and air "the finest in seldom seen sports." The special faux channel will start at midnight from Monday going into Tuesday and air coverage of sports like disc golf and trampoline dodgeball. In "DodgeBall," The Ocho is the channel that televises the Las Vegas Dodgeball tournament where the Average Joe's team compete against Globo Gym in order to save their own gym. Unfortunately, commentators Cotton McKnight and Pepper Brooks from "DodgeBall" will not be available when ESPN8 airs on Tuesday. Most of the events will also be available on demand and on streaming devices. All of the events have previously aired on ESPN at different times. See below for The Ocho's full schedule. Tues, Aug 8 Midnight 2016 American Disc Golf Championship ESPN8: "The Ocho"
2 a.m. 2016 WFTDA Roller Derby Championships ESPN8: "The Ocho"
4 a.m. 2016 Sky Zone Ultimate Trampoline Dodgeball ESPN8: "The Ocho"
5:30 a.m. Firefighters World Challenge XXV ESPN8: "The Ocho"
8 a.m. 2016 Kabaddi World Cup Final ESPN8: "The Ocho"
9 a.m. World Darts Championship ESPN8: "The Ocho"
11:30 a.m. Arm Wrestling: Best of WAL 2016 Championship ESPN8: "The Ocho"
12:30 p.m. 2017 Championship of Bags ESPN8: "The Ocho"
2:30 p.m. EVO 2017 World Championship – Street Fighter ESPN8: "The Ocho"
5:00 p.m. Moxie Games ESPN8: "The Ocho"
7 p.m. U.S. Open Ultimate Championship ESPN8: "The Ocho"